Damn I love this bike! Is it bad that I like this bike so much when the frame was only a fraction of the cost of the Salsa? The feel and handling were instinctive. 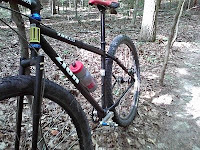 I rode the old trails at Poca yesterday, first the green, then blue, then red. I was hopping it around and clearing some stuff that had given me more trouble before. Only gripes were that the cranks I’m running on this bike are 175mm length rather than the normal 170 that I usually run, so I had a couple pedal strikes (my poor eggbeaters) and that the EBB shell and set screw tightening style is cheap and not so great….a bushnell EBB is in the mail however, so that should be cured soon. Also the cable routing leaves a little to be desired, but a minor detail. The chainstays are shorter and the geometry makes the bike easier to loft and manual, plus technical handling is better. The Salsa might have a more smooth ride overall, but I’ll give up a tiny bit of cush for the increased handling properties. 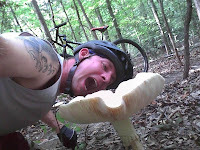 While on Tall Oaks (blue trail) I came upon this ginormous shroom. I ate the whole thing but soon developed a little tummy-ache, plus things got all weird.